They say if you find an acorn, pick it up and put it in your pocket for good luck, but on a stormy night, put it on your windowsill to protect the house from lightning. Those same folks say that to change a bed on a Friday ushers in bad dreams. So then, be careful not to wet the bed early on Friday morning. Saturday will be a long and stinky day away. Lettuce is believed by many to stir feelings of love. If this is true, then why do so many bachelors complain about their dates choosing a salad for a meal on the first date? Shouldn’t they be applauding this selection? Perhaps it is because of another superstition — that lettuce fights the effects of alcohol. For many of these sinister bachelors, this is counterintuitive to their intentions, that is, they’re not looking for love but instead an alcohol-laden date. Well played, ladies. Supposedly, if you bite your tongue or cheek while speaking, it is an indictment that you are lying. This actually happened once to a particular “someone” who was sitting in my office accusing me. Hmmm. Superstition? Personally, I think an angel reached out and smacked him in the back of the head. Be sure to never position your bed in a north or south alignment. It brings bad luck. But with that, these same superstitious folks say that a person will have his best nights of sleep while positioned with his head to the north and his feet to the south. So, here we are faced with a choice — bad luck or better sleep? We can’t forget the number thirteen. This one is dripping with superstition. Many airports don’t have a thirteenth gate. Many airplanes don’t have a thirteenth row. Most hotels don’t count a thirteenth floor. The Italians, I hear, don’t use the number thirteen in their national lottery and quite often you will find that houses addressed between twelve and fourteen are typically numbered as twelve-and-a-half. Equally strange, not all that long ago in France, there were folks who employed themselves as “quatorzièmes.” We would call them “fourteeners.” Their job was to be the fourteenth guest at a party. A party with thirteen guests was believed to be destined for disaster. And so with all of this ridiculousness under our belts, we may consider the Jura Superstition edition. This bottle is one of several that I opened in the evening of Easter Day. The nose offers a timid and ghostly vapor of smoke tinged with sherry. Now, when I say timid, I mean it. 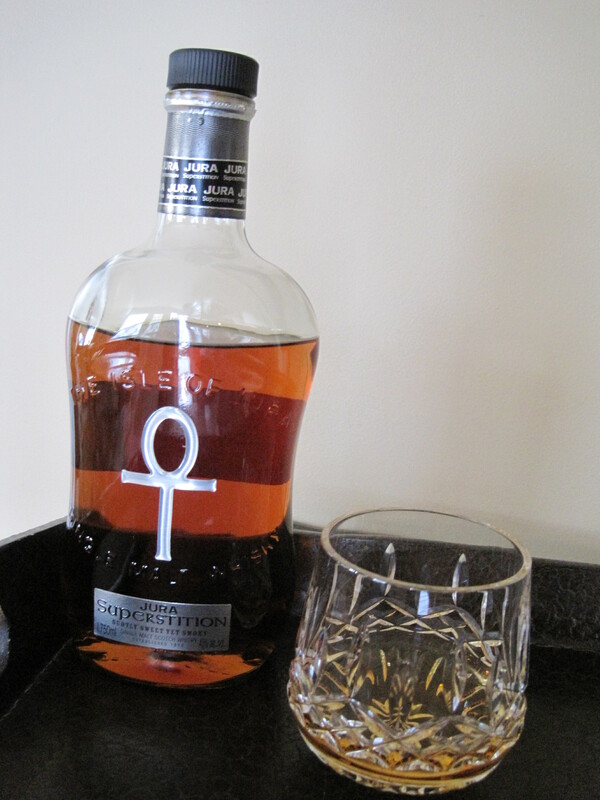 For anyone seeking to be carefully immersed into the world of smoky Scotch, this one is a great “waist-deep” attempt. The palate was a little bitter at first, but the longer the savoring, the sweeter it seemed to become. I sensed honeyed fruit. The finish was reasonably sweet with a little bit of smoke remaining, but also it was quicker than I expected, which again, may be a good reason to try this one before delving into heavier editions. I hear that if you finish this bottle while telling a lie, laying head to the north, with a soggy acorn in your pocket from wetting the bed, while playing the number thirteen in the lottery — you’ll have bad luck — that is, you’ll be a couple of bucks short of being able to buy another bottle. Be careful.